LA Dental Clinic is a family run dental office in the heart of Los Angeles, California. Dr. Arezoo Nasiry and Dr. Azy Nasiry are a team of sisters, who have dedicated their lives to the dental profession. They are constantly furthering themselves with education and experience by staying up to date with the latest in dental advancements. LA Dental Clinic provides a variety of general dentistry services, ranging from dental examinations to deep cleanings that help to treat gum disease. The professional staff provides preventive and restorative dental work for the entire family. Your first visit to LA Dental Clinic will include a dental cleaning and an oral exam. Whether you are young or older, your oral health is our top priority and this is certainly not an exam that you can fail. Our dentists are gentle and careful, we want to be sure you feel comfortable! Each member of our team provides individualized dental care. We understand that for some, going to the dentist can cause the heart to start racing. We want to assure our patients that once you set foot in our office, our goal is to make you feel relaxed and welcome, just like part of the family! Our top priority is your individual oral hygiene and health. We strive to make sure you leave our office smiling! Our clinic provides a variety of routine examination procedures for patients concerned about their oral health. When you visit us for the first time, we will take the necessary radiographs and do any preliminary tests needed in order to assess your dental health and diagnose any treatment you may need. A thorough dental cleaning is a routine part of the initial exam. We will ask you questions about your general and dental history to help us understand your wants and needs. It is best to know as much as possible about a patient’s past dental challenges or concerns, and we gather this information as soon as a new patient joins us. It is important to properly identify and diagnose any onset of disease or infection early. During your dental exam, our dentists will take x-rays of your teeth so we can screen for potential cavities or problems within the teeth, gums, and jaw bones. Radiographs are necessary as a lot of what happens in the mouth is unseen, hidden within the teeth themselves. Your dentist is able to identify any signs of infection or even bone loss in the jaw. Radiographs can be used to assess whether adult teeth are coming in correctly in children. In young adults, radiographs are essential when identifying the position of impacted wisdom teeth and whether or not they necessitate removal. If you are missing teeth, dental radiographs can help in assessing whether there is sufficient bone for implant placement or if a bone graft is required. Radiographs are routinely taken as part of the bi-annual cleaning and are used to monitor the health of your teeth. After your radiographs, your dentist will discuss the findings and any treatment options if needed. During your cleanings, your dentist will examine your mouth for any signs of oral cancer. Your dentist can screen for changes in your soft tissues that may be an indication of oral cancer. You will also be able to talk with your dentist about any pain or concerns you may have about the condition of your oral health. Your dentist is trained to identify all signs and symptoms of oral cancer, and they may notice something in your mouth that you have not. Oral cancer, in its early stages usually appears as a simple sore in the mouth, that doesn’t heal. It can be mistaken for a number of minor conditions like canker sores or HSV 1, and the patient usually overlooks the early symptoms. It is paramount that a patient get frequent screenings for oral cancer, especially if they have a history of smoking, untreated abscesses or chewing tobacco. Oral cancer, if not treated soon enough, can progress silently and rapidly. A patient will not notice symptoms until they reach critical stages, when it may be too late to treat easily. Oral cancer can spread to the jaw, lymph nodes, esophagus, bloodstream and even the brain if left long enough. It is absolutely vital to be screened by your dentist to ensure you have the best possible chances of keeping this disease in check. During a regular cleaning, your dentist will screen you for gum disease, and answer any questions a patient may have on the topic. Gum disease is an infection of the sensitive tissues around each of your teeth. It can cause the gums to become irritated or inflamed, which can make them loosen. Gum disease is the leading cause of tooth loss in adults. It can be caused by hormonal changes during pregnancy or menopause and poor oral habits like bad hygiene or smoking. Gum disease can also be genetic, and a patient can be predisposed to the illness. It is, therefore, necessary at this stage for a dentist to assess the patient and learn about their previous dental history. In the regular cleaning appointment, it is routine to examine all teeth for signs of tooth decay. Your dentist will evaluate your oral health and take note of any early signs. They will also give the patient advice on preventative measures when it comes to dealing with this common illness. Tooth decay can appear as anything from visible cavities, to small white spots on the teeth. Tooth decay is often easily prevented with intensive fluoride treatments when it emerges at its early stages. Cavities should be quickly filled and dealt with as soon as they appear, so the dentist can preserve the tooth. The x-ray screening is very useful at determining early signs of tooth decay. It can detect cavities before they even become painful, or visible to the patient. The bi-annual cleaning is focused on early prevention, and when cavities are monitored and managed immediately, there is a high chance of preventing further issues with tooth decay. If you have received fillings or dental implants in the past, it is important for your dentist to know your previous dental history. During the routine cleaning, your dentist will observe any old dental work that you have had done. They may assess whether or not fillings need to be updated or resized. You can let your dentist know about anything that is not working for you, and can have improvements or replacements made for your mouth. If you have concerns regarding the aesthetics of your teeth or find that you have trouble areas in your mouth it is important to let us know at this stage, during the dental exam as well. This way we can tailor a treatment plan based off of your needs right away. We may take a mold of the patient’s mouth to create a model for future procedures, or to identify changes in your mouth over time. Once we know about a patient’s needs and have their dental information we can properly formulate a highly tailored plan in order to proceed. This plan could be anything from simply, bi-annual cleanings, to adding implants or veneers. Whatever your dental requirements, our new client screening can help us determine the best way to proceed with an oral health plan that benefits you. At LA Dental Clinic, we provide bi-annual cleanings. We are also able to accommodate all other requests when it comes to maintaining regular dental hygiene and cleanings can be booked by appointment whenever the patient feels one is needed. Regular cleanings are the key to healthy gums and teeth. They are the best way to maintain proper oral health at any age. Proper cleanings can prevent gingivitis and more serious gum infections. They can lead to early detection of tooth decay and are the best preventative measure a patient can take in order to avoid dental problems in general. Good oral health and hygiene are our top priority for patients. Regular cleanings are needed twice a year. During cleanings, a patient is screened for oral cancer, gum disease, and other potential maladies. Our regular cleanings include fluoride treatments to restore minerals and fortify tooth enamel. Our patients can choose between two different versions of the treatment when they come in for their bi-annual cleanings. Fluoride is an essential mineral that greatly benefits the teeth. Every day as we eat and drink, our teeth lose minerals that help to keep the tooth enamel strong and healthy. Harmful plaques erode essential minerals and enamel, the protective outer layer of the teeth. Loss of enamel can eventually lead to tooth decay if left untreated. Fluoride helps to prevent erosion by making the enamel more resistant to acids and bacteria that are present in our mouth and our food. Fluoride prevents cavities and reverses signs of tooth decay when caught early enough, for example, in children. It greatly improves the speed at which teeth remineralize. It protects your teeth and the tooth enamel. Topical fluoride treatments involve the direct application of fluoride to the teeth. One of our dentists will apply a gel fluoride to the teeth and let them sit in the treatment for a few minutes. You wear a mouthguard filled with the fluoride solution. Fluoride treatments normally do not take longer than a few minutes and a patient’s teeth feel clean and healthy after. Systemic fluoride treatments are also available to our patients. These are especially useful for clients with sensitive teeth, as the topical fluoride treatments can feel cold on the teeth. This can end up causing patients with temperature sensitivities to feel discomfort. Systemic fluoride treatments are quick and easy and a patient can simply ingest fluoride supplements. With the systemic treatments, a patient can be prescribed fluoride supplements to take as needed, on their own time. LA Dental Clinic we provide deep cleanings, for those that may need a much more extensive clean, or are showing signs of gum infection or irritation. A deep cleaning is slightly different from our routine cleanings. It’s for patients who experience early signs of gingivitis or periodontal disease. Periodontal disease is especially important to prevent as it can often go unnoticed for years. It can cause gums to become infected and teeth to shift as a result of changing, swollen tissues. Deep cleanings involve scraping the diseased and infected areas around the root of the tooth, in order to remove plaques and pockets of calculus or tartar that have built up over the years. These plaques can cause severe gum irritation. Gingivitis is often treated effectively with deep cleanings and proper at-home care. Deep cleaning prevents the growth of bacteria that causes bad breath. 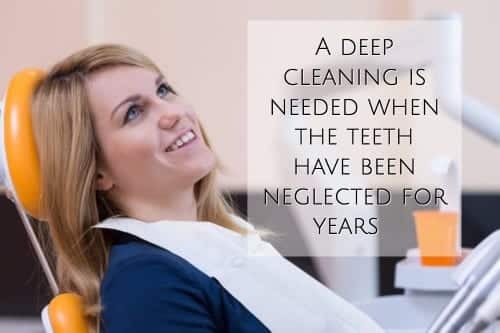 Deep cleanings should not be a frequent treatment for patients as they can be hard on the gums. Typically, we perform deep cleanings every 3-4 months in severe cases, to monitor patient improvements. Once your oral health improves you can return to the bi-annual dental regime. After deep cleanings, we inform the patient on the correct way to properly maintain their personal oral hygiene regimen. Our dentists can identify teeth in need of a root canal during regular or deep cleanings. A patient can also book an appointment to have their teeth examined for the presence of a root canal if they are experiencing pain or oral discomfort. The root canal procedure is the most effective way to save a patient’s natural tooth when there is an infection or abscess at the root. They are necessary when the level of tooth decay is so extensive that bacteria has reached the pulp of the tooth. The pulp can become infected when tainted by bacteria and cause an abscess to develop below the root of the tooth. The patient often knows they have a root canal as they experience severe pain once the tooth becomes infected. The nerve of the tooth can become inflamed and is unbearably painful. Our job is to remove the infected pulp of the tooth and replace it with a filling that fills the entire root. We use a multitude of different instruments to achieve this, in a process that normally, will not take more than an hour. If an abscess develops you will receive antibiotics. The dentist will fill the tooth with a filling that contains antibacterial properties. They cap and seal the filling to ensure bacteria can no longer enter. A root canal is similar to a regular filling. The dentist removes the infection and fills the tooth. We ensure that the root canal is a painless process for the patient. It is important to remember that a tooth is more delicate after a root canal treatment and can often be brittle, as a result of its missing pulp. The tooth may be more susceptible to pressure or break easily. The procedure preserves the tooth so the patient does not need an implant. Implants can wear on a patient’s jaw bone and eventually cause it to weaken, resulting in bone loss. It is, therefore, important to be careful with your teeth after a root canal procedure to prevent breakage. Root canals can also be prevented by maintaining proper oral hygiene and attending regular dental check-ups. Since the start of her practice in 2008, Dr. Arezoo demonstrated a commitment to achieving excellence within the field. Joined by her sister Dr. Azy, in 2016, this highly educated team has formed one of the most successful dental clinics in Los Angeles. At LA Dental Clinic we pride ourselves on delivering top quality treatments for all family, orthodontic and cosmetic dental needs. We provide a broad spectrum of treatments, from general or deep cleanings to root canals, braces, Invisalign and dental implants. Our friendly staff and team of dental professionals provide a warm and customized experience for every single one of our unique guests. We have a brand new office and state of the art equipment, to provide impeccable, top notch service. Our dentists are gentle and considerate of patient needs and concerns. We look to personalize every interaction with our patients so they can stay informed about their dental health, and feel at ease in the dental chair. We have the technology and experience to assist with all of your dental needs and requests. Drop in and meet our team of qualified staff. Our variety of services and treatments will meet all of your dental needs. We put our patients first and aim to make our guests feel at home in our clinic. If you want to learn more about us, feel free to meet our team on our website, or give us a call!